A stylish men's stainless steel bracelet watch from the iconic Aquaracer series by TAG Heuer. Designed with a black centre with yellow and white accents throughout the dial and a date window at three o'clock. With water resistance up to 300 metres, this is pure indulgence from TAG Heuer. 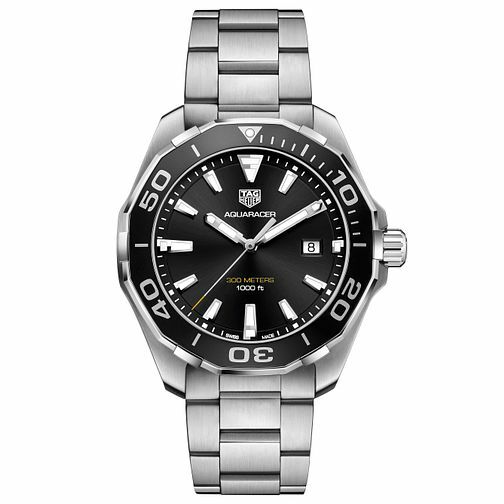 TAG Heuer Aquaracer Men's Stainless Steel Bracelet Watch is rated 5.0 out of 5 by 2. Rated 5 out of 5 by Anonymous from Fantastic watch! I purchased this watch last weeks and I'm really happy with it. I had been looking at watches for months trying to decide which one I wanted and decided on a tag, with the aqua racer it's a really stylish, eye catching watch that has already got a lot of attention. The quality of the build is great, the watch feels really solid, I personally couldn't recommend a better watch for the money!